Myles Jack (left) and Anthony Barr have earned honors for their play in 2013. UCLA has a storied tradition at linebacker. Through the decades, Ken Norton Jr., Roman Phifer, Jamir Miller, Donnie Edwards, Robert Thomas and Akeem Ayers have rocked opponents in Westwood. 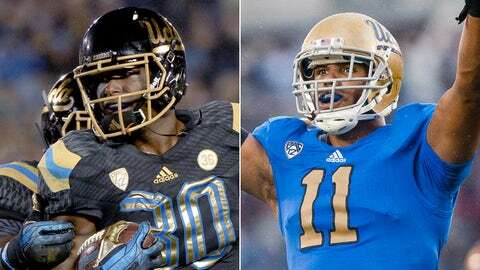 Anthony Barr and Myles Jack, senior and freshman, are poised to join the Blue and Gold honor society. Ask their position coach, Jeff Ulbrich. “Barr is going to make more money than I ever saw in the NFL,” Ulbrich, a nine-year NFL vet with the San Francisco 49ers, said at a recent practice before UCLA faces Virginia Tech in the Sun Bowl on Dec. 31. Barr, 6-foot-4 and 248 pounds, has won every All-American honor you can think of and is predicted to be a top-five pick when he attends the 79th NFL Draft at Radio City Music Hall in New York City in May. While Barr remained under the radar his first two seasons, Jack finished his first collegiate season as the Pac-12 offensive and defensive freshman of the year, the first time the feat has been accomplished in the six years the award has been in existence. When asked about Jack, Ulbrich’s eyes widened. The 6-1, 225-pound Jack sees himself like James Harrison, even though the Cincinnati Bengals linebacker is 70 pounds heavier. Jack loves the physicality that Harrison brings to the field and how diverse he is when in coverage or rushing the quarterback. I asked Jack who he is as a football player. When Jack arrived at training camp last summer, he was an non-confident true freshman, hoping to find his way in an FBS program. He wasn’t sure he was going to see the playing field his freshman year. Camp had proven to be harder than anything he had ever done before in football, a game that has always come easy for the Washington high school star. Barr felt the same way in 2010 when he arrived in Westwood as a running back. The ensuing two seasons, Barr bounced around from running back to receiver and tight end and lost his love for the game. “Coach (Jim) Mora saved me from football purgatory. I wasn’t sure if I wanted to continue to play football, he changed my life and my career,” Barr said when recounting the switch from offense to defense and what Mora’s impact was on his UCLA experience. I asked Barr why he stayed at UCLA for four years and what advice he had for Jack when it is his time to decide to stay or leave? Jack looks up to Barr, who is a great role model and is teaching his protégé what it takes to be an All-American linebacker. From how to handle pressure, how to practice to get better each day, to off-field behavior and sticking to your goals. The linebacking tradition, which I am proud to be a part of, continues at UCLA. After the Sun Bowl, Barr will turn the torch over to Jack. It will continue to burn bright.